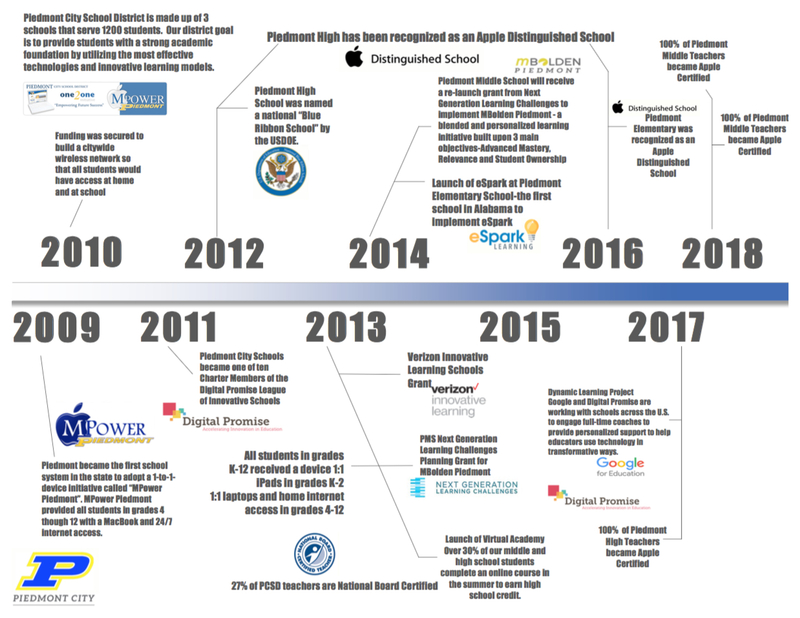 Piedmont City School District has a recent and successful history of innovation. Over seven years ago, the school board approved an initiative called “MPower Piedmont”, that has a goal of community transformation. “MPower Piedmont” placed a laptop computer in the hands of every student in grades 4-12. Funding was later secured to build a citywide wireless network to provide constant Internet access to students. Today, every student in the Piedmont City School District has a device. Students in grades K-3 use iPod, iPad, and Macbook. Students in grades 4-12 are issued a personal Macbook Air. Our 1:1 device initiative and wireless network allows every student in the Piedmont City School District access to 24/7 on-demand learning. The Piedmont City School District is one of ten charter members of the Digital Promise League of Innovative Schools. The League of Innovative Schools was created by Congress to transform teaching and learning in America’s public schools through the innovative use of technology. Call the Eligibility Line to see if you qualify!